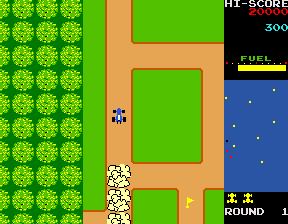 In 1980, Namco released a four-way scrolling car chase maze-style game called Rally-X. In the same style as Pac-Man, you run around collecting the flags, avoiding the bad guys and progressing through levels. The screen is set into a maze and a radar and score – this is a style we’ll see again on the upgrade to this, inventively called New Rally X and then on Bosconian – a rare to find game. Personnally, Rally X grates on me a bit, I like the game but ultimately i’m looking to convert it to New Rally X as the game is just more fun and the music is better. I don’t remember seeing Rally X in the arcades back in the glory days but always saw New Rally X. The game was found via an eBay auction with a dead monitor (flyback arcing like mad), so i’d been saving a Hantarex MTC900 14″ for a rainy day so gave it a service and cleaned up the machine. Its been done just in time for Play Expo for our monster arcade – along with the Northern Lights Pinball guys there’ll be around 250 video games and pinball machines there. Check out the event and see our videos on it if you missed it. For now, enjoy this little video. Its available to hire for your events and parties in our standard category.